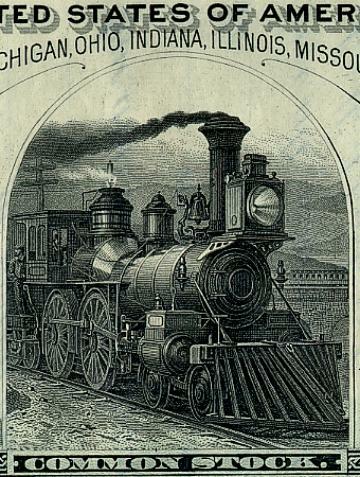 Beautifully engraved certificate from the Wabash Railroad Company issued in 1890. 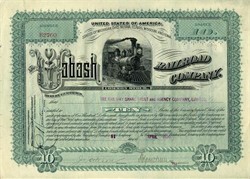 This historic document was printed by Western Bank Note Company and has an ornate border around it with a vignette of a steam locomotive. This item has the signatures of the Company's President and Secretary and is over 116 years old. The Wabash Railroad (AAR reporting mark WAB) was a Class I railroad that operated in the mid-central United States. It served a large area, including trackage in the states of Ohio, Indiana, Illinois, Iowa, Michigan, Missouri and Ontario. Its primary connections included Chicago, Illinois, Kansas City, Missouri, Detroit, Michigan, Buffalo, New York, St. Louis, Missouri, and Toledo, Ohio. The Wabash's major freight traffic advantage was the direct line from Kansas City to Detroit, without going through St. Louis or Chicago. The Toledo and Illinois Railroad was chartered April 20, 1853 in Ohio to build from Toledo on Lake Erie west to the Indiana state line. The Lake Erie, Wabash and St. Louis Railroad was chartered in Indiana on August 19 to continue the line west through Wabash into Illinois towards St. Louis, Missouri, and the two companies merged August 4, 1856 to form the Toledo, Wabash and Western Railroad. The company soon went bankrupt and was sold at foreclosure. The Toledo and Wabash Railroad was chartered October 7, 1858 and acquired the Ohio portion October 8. The Wabash and Western Railroad was chartered on September 27 and acquired the Indiana portion on October 5. On December 15, the two companies merged as the Toledo and Wabash Railway. Later mergers and reorganizations formed the Toledo, Wabash and Western Railway on July 1, 1865, Wabash Railway in January 1877, Wabash, St. Louis and Pacific Railway on November 7, 1879, and Wabash Railroad on August 1, 1889. In 1904, the Wabash Pittsburgh Terminal Railway was formed and acquired control of the Wheeling and Lake Erie Railroad, giving the Wabash access to Pittsburgh, Pennsylvania as the final step in an attempt to break the near-monopoly of the Pennsylvania Railroad and New York Central Railroad for traffic to the east. However, the Wabash had overextended itself, and the WPT went bankrupt in 1908; it would later become part of the Pittsburgh and West Virginia Railway. The Wabash Railroad itself was sold at foreclosure July 21, 1915 and reorganized October 22 as the Wabash Railway. The Pennsylvania Railroad acquired loose control of the Wabash in 1927 by buying stock through its Pennsylvania Company. In 1929 the Interstate Commerce Commission charged the PRR with violating the Clayton Antitrust Act. The ruling was appealed, and in 1933 the Circuit Court ruled that the control was for investment only and did not violate the act. Wabash Railway again entered receivership on December 1, 1931. The Wabash Railroad, controlled by the PRR, was organized in July, 1941 and bought the Wabash Railway on December 1. In fall of 1960, the PRR agreed to a lease of the Wabash by the Norfolk and Western Railway. The PRR's Detroit, Toledo and Ironton Railroad assumed control of the Wabash on December 31, 1962. On October 16, 1964 the New York, Chicago and St. Louis Railroad (Nickel Plate Road) merged into the Norfolk and Western Railway, and the N&W leased the Wabash and Pittsburgh and West Virginia Railway. On March 31, 1970 the Pennsylvania Company exchanged its last Wabash shares for N&W common stock; that stock was later divested as a condition of the 1968 merger into Penn Central Transportation. The profitable N&W was itself combined with the Southern Railway to form the Norfolk Southern Railway in 1982. The Wabash Railroad Company stuck around until it was absorbed into the Norfolk Southern Corporation in late 1991.